Microsoft and Johnson Controls have collaborated to create the GLAS smart thermostat. 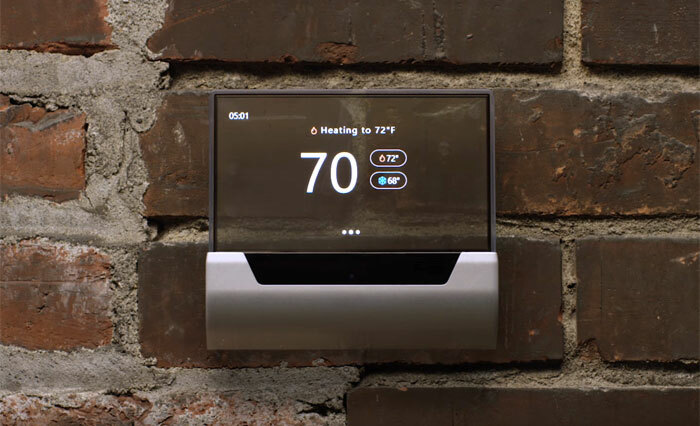 Johnson Controls claim to be "the inventors of the first thermostat," and is one of the leading providers of heating, ventilation and air conditioning (HVAC), fire and security systems in the world. Microsoft brings to this collaborative product its Windows 10 IoT Core, Cortana voice services, and Azure Cloud. Rival smart thermostats like the Nest, Hive, and Netatmo devices are now commonplace but this new device looks somewhat slicker, and that's before we get into the capabilities. If you watch the video, below, carefully you will see that the GLAS might be so named because it is largely constructed around a translucent touch screen. Users can interact with GLAS to modify their environment, controlling heating systems and air conditioners quickly and intuitively with the touch screen. Perhaps even more intuitively and conveniently, Microsoft's Cortana voice controls allow you to command the smart thermostat. No companion app details or web interface controls were shown but it should be controllable via any Cortana powered devices you use, like your Windows 10 PC. Smart thermostats also, of course, use cloud intelligence to figure out how to optimally adjust your home's environment and the GLAS does this too. The Windows IoT core powered device can detect your presence and consider air quality indoors and out. Pricing and availability haven't been touched upon or communicated in any press release so far. This is just the second smart home device based upon Microsoft technology since the launch of the Cortana Skills Kit in May. That launch was accompanied by a teaser for the Harman Kardon Invoke personal digital assistant home speaker system. Source: Microsoft YouTube video via Engadget. Neat enough looking, I guess. I use the NEST, but I found the home/away detection unreliable - however as a remotely controlled thermostat its pretty useful. Being able to turn on the heating when I know Ill be home (rather than estimating with a manual programmer is a plus. Perhaps, but data privacy is not the only issue. Another is longevity. Let's hope neither Google or any future buyer of Nest Labs treat Nest users the way Nest treated Revolv users …. I.e. just deciding to shut down the servers the devices relied on, leaving users with an expensive piece of useless junk hanging on their walls. Couldn't happen? Already did, once. We really do need a newer data protection act. I've just moved to android sadly, and it's frankly terrifying the stuff they demand to know about me to have a usable smart phone. I'm making a big gamble that they are always acting in a manner that doesn't inconvenience me too much.